I’ve been taking a Processing glitch art class with dadageek for the past month. 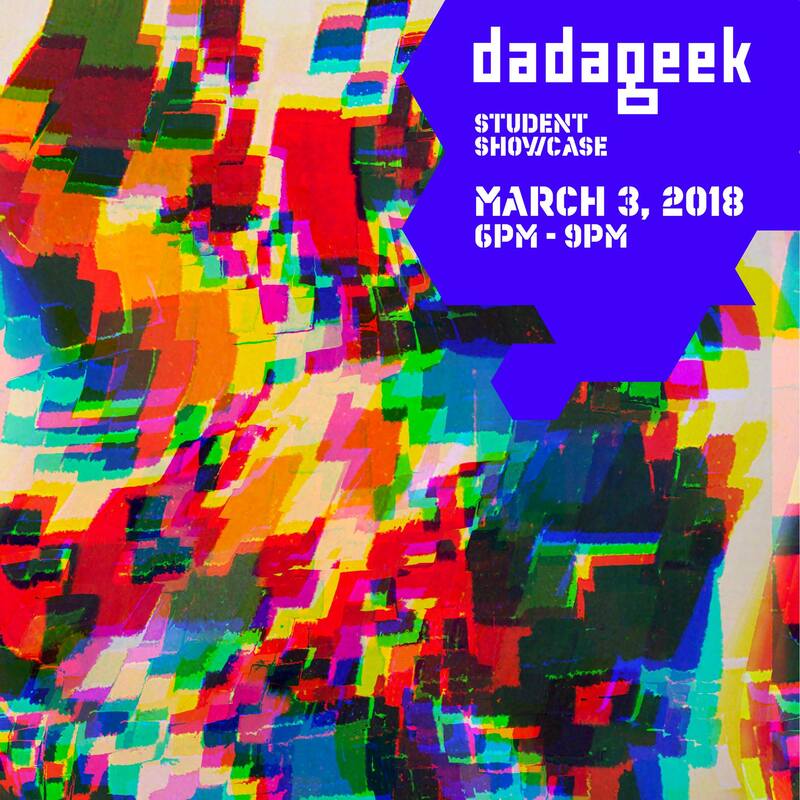 Tonight, students from all classes will be showing their work at the dadageek Student Showcase. Should be a fun evening of tech, sound, interactive art and more. While HTML and CSS are certainly not unfamiliar territory (and being Java-based, Processing isn’t that much different), I’ve never really coded from scratch. It’s been an interesting experience to dust off the old high school math skills and work exclusively with code. I’ve always been quick to grasp mathematical concepts and processes, but struggle when it comes to putting them into action. I prefer to observe how everything works in different scenarios before I feel comfortable in working the operations myself. So while I’ve quickly discovered the are limitations to creating glitch art in Processing, ever the perfectionist, I also have to remind myself the files are called sketches for a reason. You can certainly make cool finished pieces with a lot of practice, but as with any other art form the main part of the journey is learning from your drawings. I’ll post stills and animations on the main part of my site soon. My photo/assemblage “Vigil” was accepted into the 2018 People’s Gallery Exhibition at Austin City Hall. The piece was also chosen for the official postcards and major social media images. 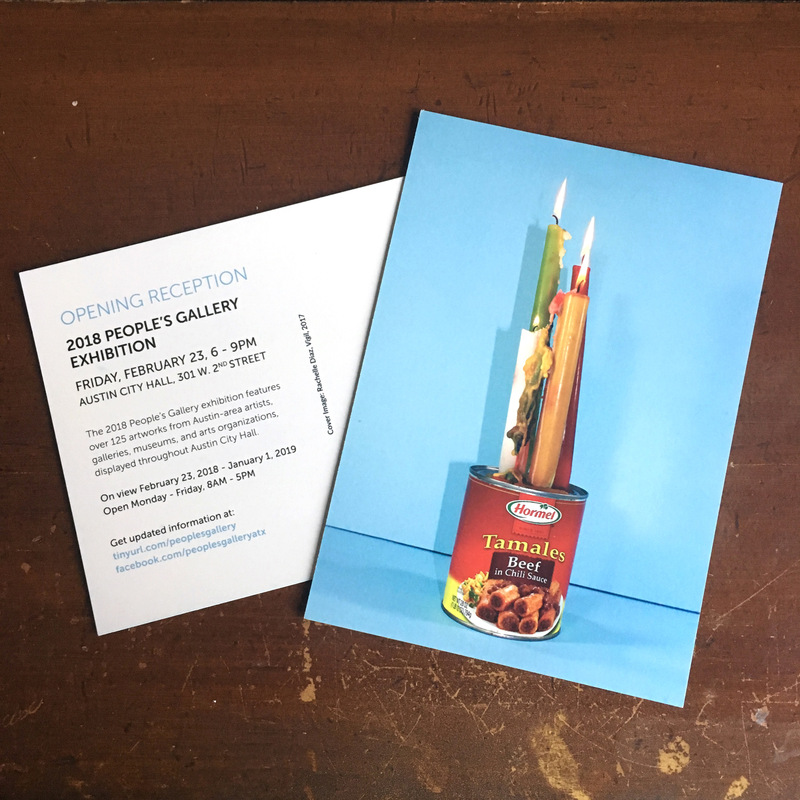 The People’s Gallery is designed to showcase the work of regional artists and to encourage public dialog, understanding, and enjoyment of visual art. Each year, the Cultural Arts Division issues a call for artworks to Austin-area artists, galleries, museums, and arts organizations, and presents a year-long exhibition of works by over 100 local artists. Visitors to the reception are invited to meet the participating artists, and to enjoy light refreshments and live music by the Austin Community Steelband. Remarks by Austin Mayor Steve Adler and others will begin at 6:30 p.m. “Vigil” is displayed on the 2nd floor of the building. 2018 selection panelists were arts educator and artist Teruko Nimura; artist and Preparator (Blanton Museum of Art, University of Texas at Austin) John Sager; and artist and Professor of Art, St. Edward’s University Tammie Rubin. 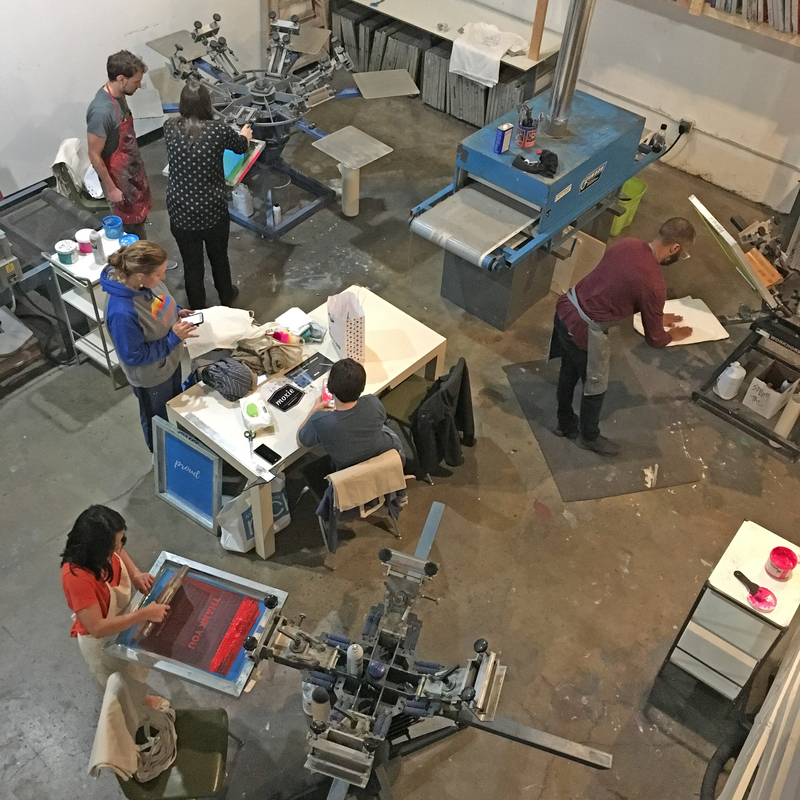 In January, I took my first screen printing class at the Artist’s Screen Printing Coop (ASPCO) in East Austin. It was a four-week introductory course that met once per week. We learned how make 1-color prints on both paper and fabric. It was a lot of fun and Amanda, the instructor, was great! 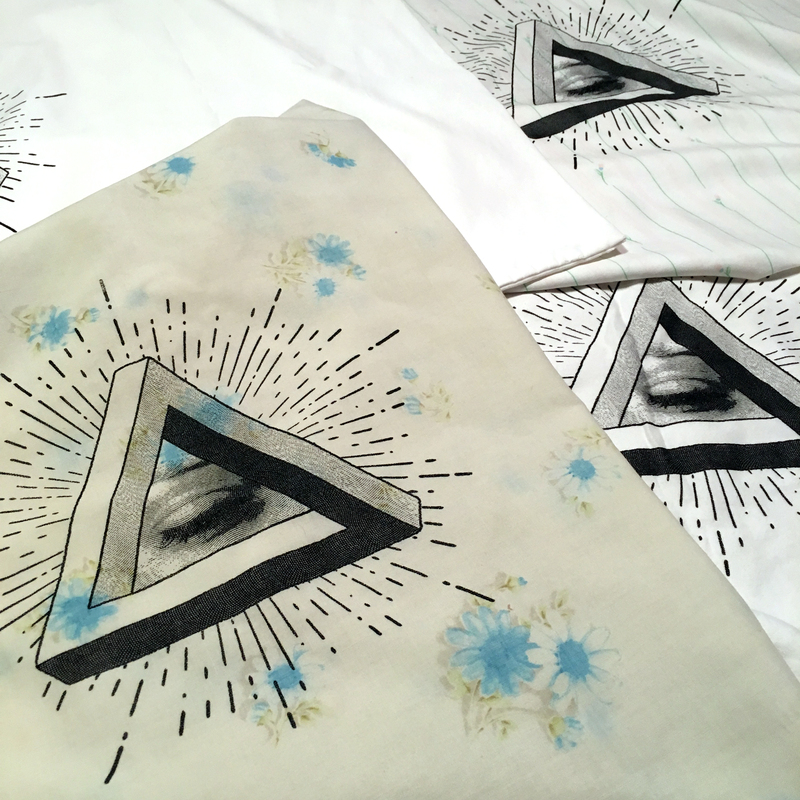 I’m not really interested in making multiples of merchandise to sell, but rather in experimentation and incorporating it into my visual art somehow. Although I do graphic design for a living and put a great deal of pressure on myself to accept nothing less than perfection (hey, I’m a Virgo), and to a lesser degree with my artwork, I was surprised that I was able completely let that slide and just enjoy the process of attempting ides I’ve had for awhile, but didn’t want to execute as paintings, drawings, or designs. I’m sure y’all have seen people wearing “The Future Is Female” t-shirts around. That design was created in the mid-1970s in NYC, and although that probably felt true a generation ago, based on recent events, I think it’s pretty obvious women are done waiting. The future is now. 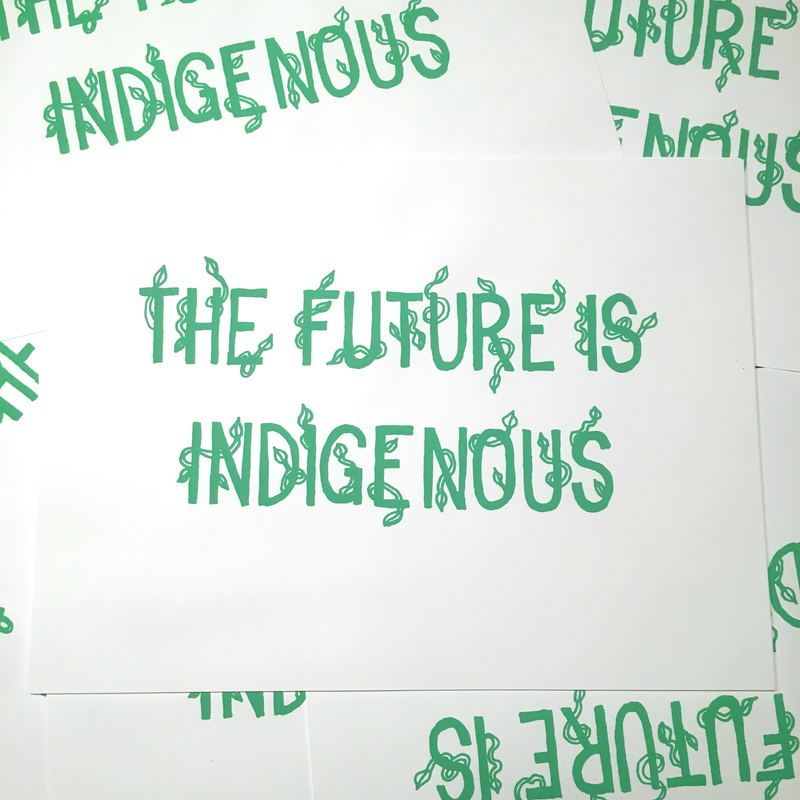 That’s why I say “The Future Is Indigenous” is next on our horizon. In order to survive climate change, we have to find ways to live respectfully and responsibly with our environment the way indigenous people all over the world have been doing for thousands of years. 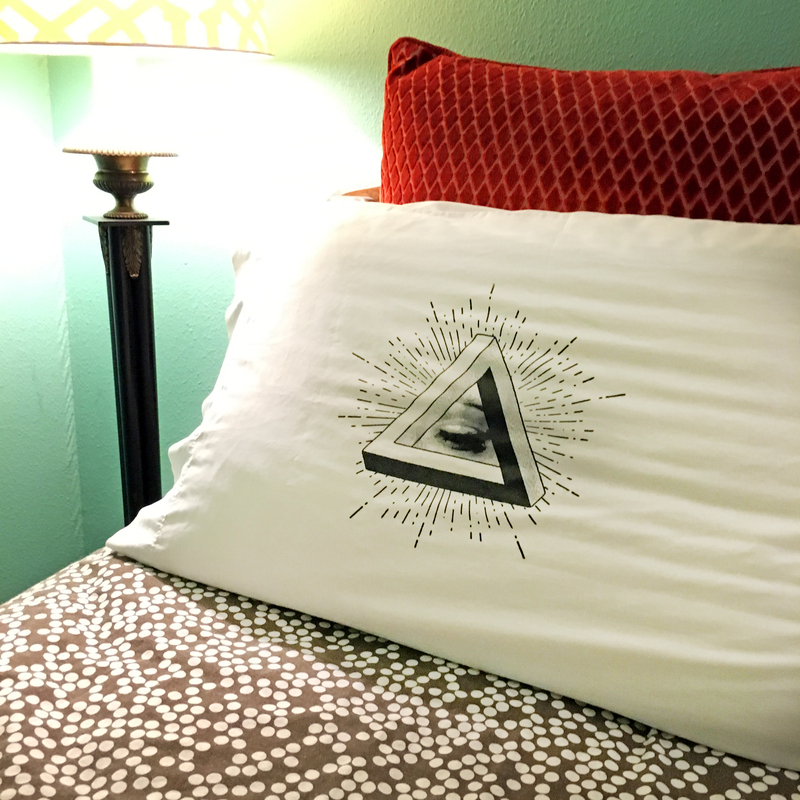 I call this the All-Sleeping Eye (or Insominati) pillowcase. 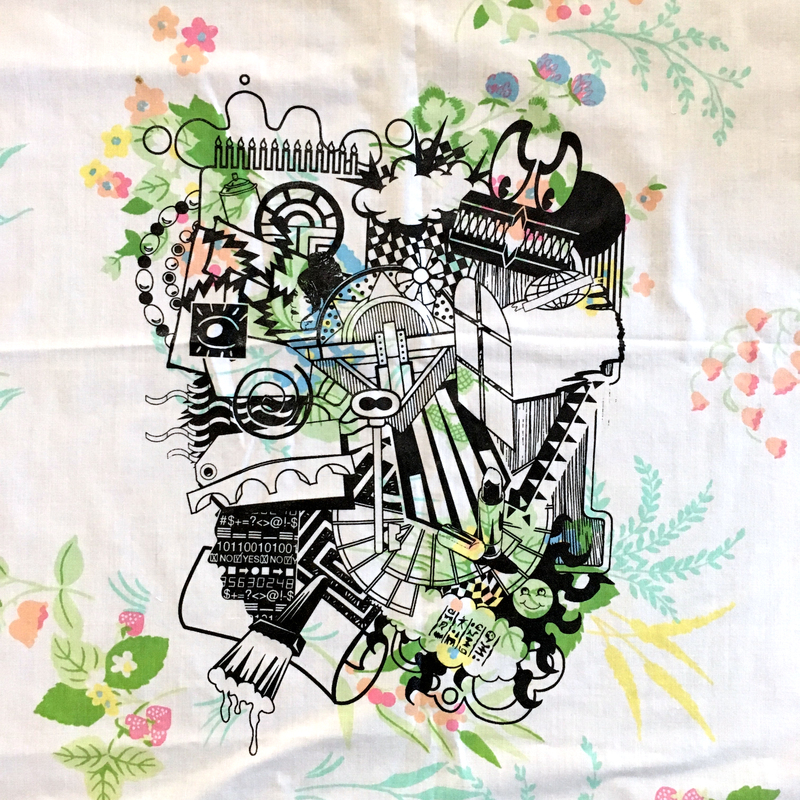 Printed on thrifted/vintage pillowcases. Vintage clip art collage on vintage fabric. Pump Project recently set up a closed Facebook group for former tenants, aka “alumni.” It’s been fun sharing photos and memories with my old studiomates going back 10 years! David de Lara, an upstairs neighbor and fellow pre-Pump OG member (Shady Tree Studios circa 2005! ), uploaded a wonderful video he put together from one of my first productions, Vision Riot. So thankful he shared this as I was too busy running around to take any event photos as it was happening. Enjoy! Two of my Rooms pieces were selected for Co-Lab Projects‘ final exhibition at DEMO Gallery, Good Mourning Tis Of Thee. So humbling to be included in a show following Claude Van Lingen’s incredible retrospective. The curators did an outstanding job on selecting and displaying the work, utilizing every facet of the historic venue. It’s truly a must-see experience. 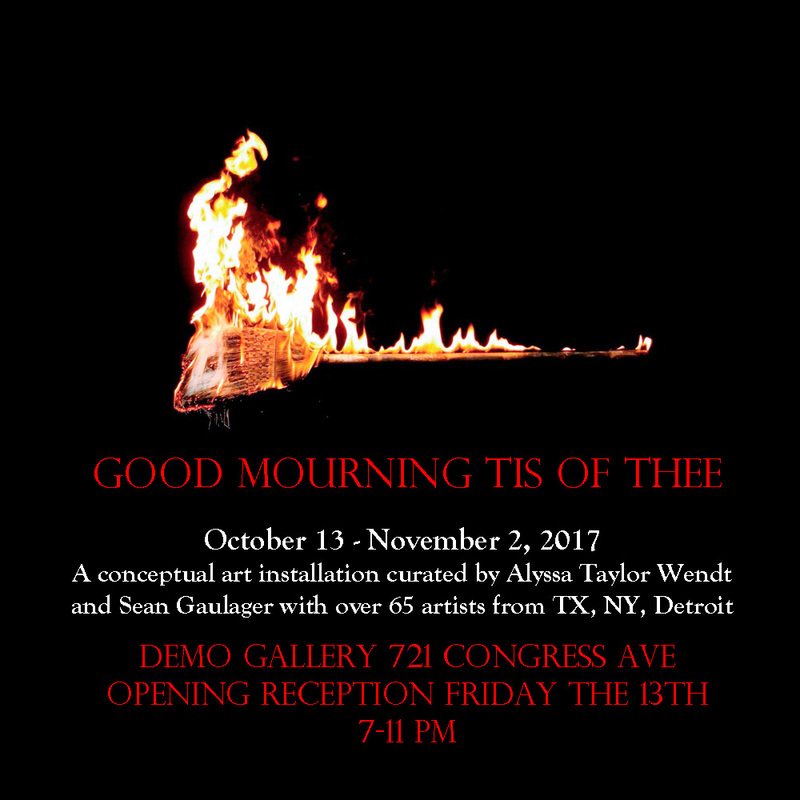 Good Mourning Tis of Thee, an expansive art installation directed and curated by the multimedia artist Alyssa Taylor Wendt and Co-Lab Projects’ Executive Director and Curator Sean Gaulager, will show work from over 65 artists and performers from Texas, New York, Detroit and Seattle. This interactive exhibition will address topical issues such as grief, loss, death, architecture and urban development. Staged in an old building shell in downtown Austin currently being used by Co-Lab Projects as their gallery space, visitors will be able to move through areas devoted to themes of mourning, darkness and transformation and occasionally interact with durational performances both during gallery hours and at designated events throughout the run of the show. The show is especially relevant as the building is slated for subsequent demolition to make room for a planned development on this site. The concept behind this show, conceived of by Miss Wendt, looks at death as a positive agent and component of change. 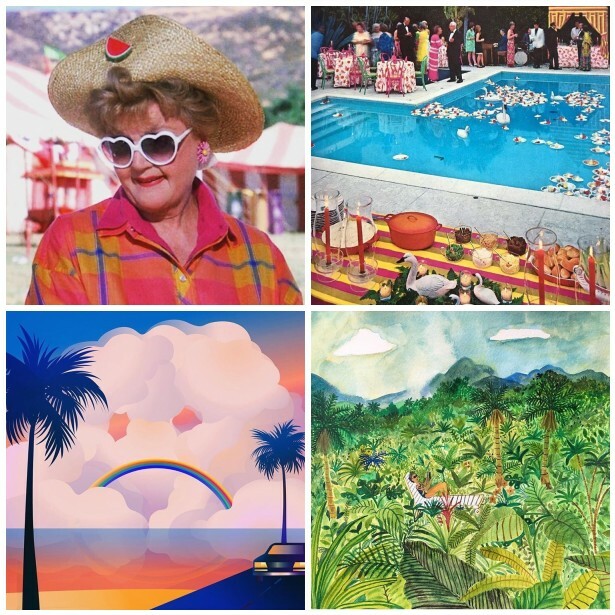 American culture has few rituals around death or processing death and she hopes that the artists involved will bring their own ideas, superstitions and rituals around mortality, as well as those of different cultures and belief systems. We all have the capacity to use such markers of change as vehicles for new beginnings and transformative magic. In a time when the country is grieving so many things we take for granted and grappling with an unpopular and oppressive political administration, we need to look for avenues of transformation and how we can use the alchemy of art and community for processing such grief. Referencing such exhibitions as Mike Nelson’s “A Psychic Vacuum”, produced by Creative Time in New York in 2003, the curators are using an existing building in its purgatorial state with a specifically built art environment so that the two are indistinguishable and each portion of the show is subjectively ambiguous, pushing questions about space and perception rather than providing dogmatic answers about how to look at art. 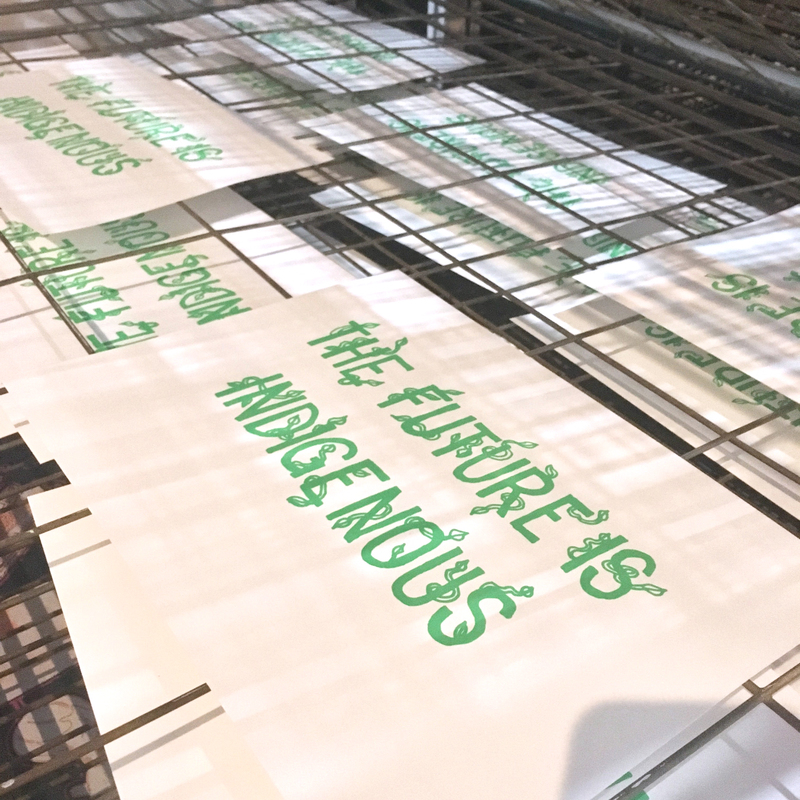 Visitors to the exhibition will be guided to move freely in between the curated areas of the building in no particular order, ending with the message implied by the title, that each one of us is a source of positive change through cycles of ending and new beginnings. Curated by Wendt and Gaulager, with a generous grant from the city of Austin and the Cultural Arts Division, they have chosen a specific group of installation artists and performers to create the immersive environment including: Jon Brumit; Chris Carlone; Gail Chovan; Maggie Douglas; Michael Anthony García; Oren Goldenberg; Joshua Goode; Brooke Gassiot; Hollis Hammonds; Ryan Hawk; Geoff Hippenstiel; Scott Hocking; Jules Buck Jones; Joseph Keckler; Jardine Libaire; Marne Lucas; Colin McIntyre; Angelbert Metoyer; Landon O’Brien; Matt Rebholz; Cristin Richard; Benjy Russell; Seth Orion Schwaiger; Elizabeth McDonald Schwaiger; Julia Solis; Michael E. Stephen; Terri Thomas; Bruce Lee Webb; Alyssa Taylor Wendt; Steve Wiman; Matt Winters; Rachel Wolfson-Smith and many others. Their contributions are sexually, ethnically and artistically diverse and will help illustrate the diversity necessary to understand and broaden our thinking about difficult subjects such as death and change. 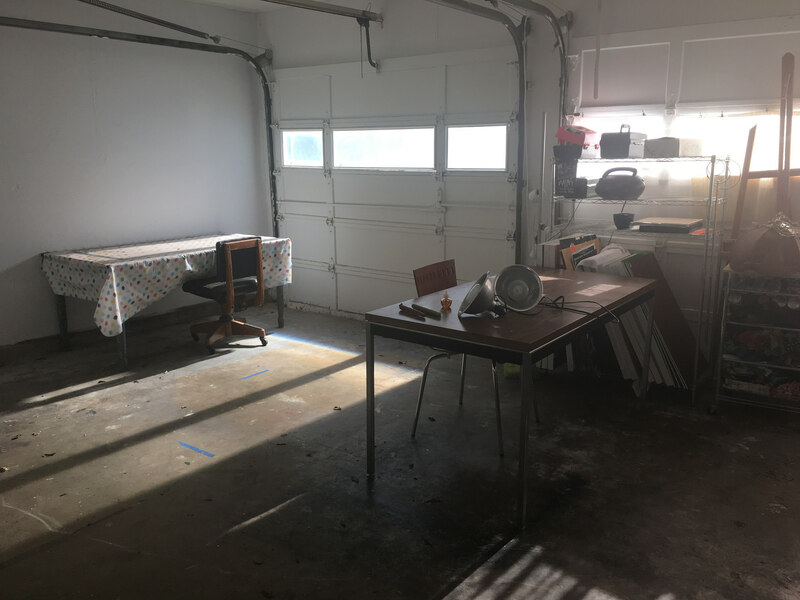 Theses artists will work with the main space and the basement to create a large variety of installed works from video to sculpture to mobiles addressing death and grief. The curators have dedicated a large salon style space in the main gallery called the Bardo Salon. 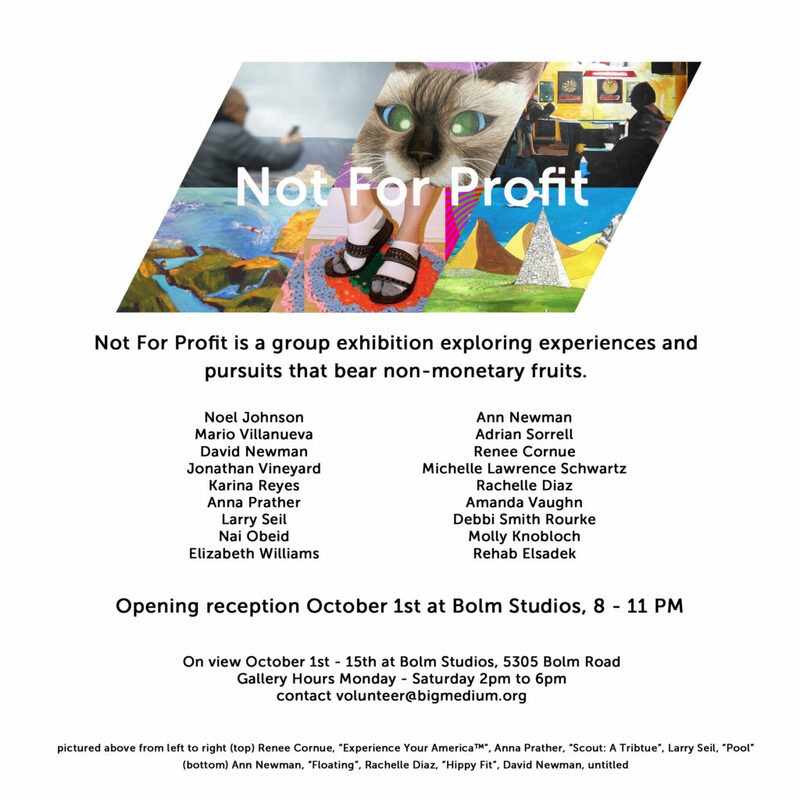 Comprised of 2D works by over 40 artists that illustrate death and sorrow in various presentations, they hope to create a space for contemplation and conversation. 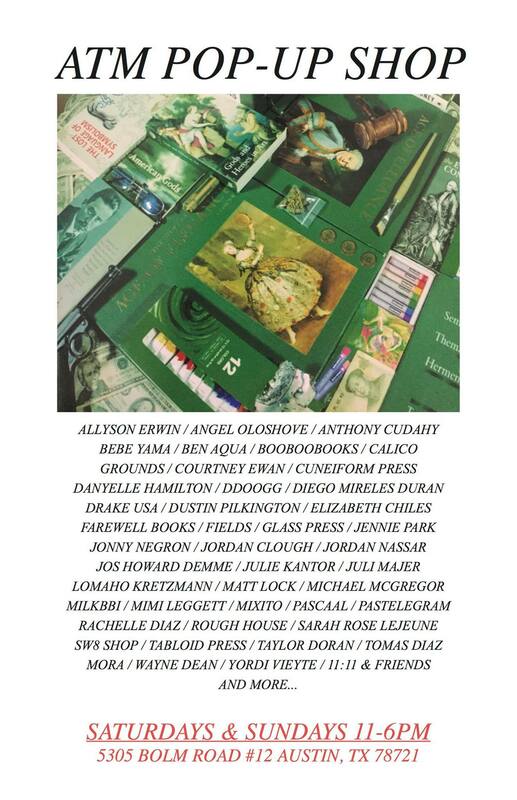 In addition to additional work from some of the aforementioned artists, contributors include: Michael Abelman; Butch Anthony; Toni Ardizzone; Shawn Camp; Livia Cocchi; Erin Cunningham; Alex Diamond; Rachelle Diaz; Dan Estabrook; Stefany Anne Golberg; Amy Guidry; Frank Haines; Katy Horan; Lindsay Hutchens; Madeline Irvine; Tlisza Jaurigue; Rebecca Marino; Robert Melton; Cynthia Mitchell; Christos Pathiakis; Lacey Richter; Beth Schindler; Lauren Silberman; Brad Walton; Jason Webb; YOUNGSONS and Marcus Zilliox. Performances and events will take place both on designated evenings, listed in our public programs below, as well as durationally during gallery hours. Performers include: Chris Carlone; Marnie Castor; Michael Anthony García; Ryan Hawk; Joseph Keckler; Travis Kent; Jardine Libaire; Marne Lucas; and Sandy Smiles (Frank Haines). Alyssa Taylor Wendt has a long history with both visual art and performance. A unique project for Austin, this exhibition explores both issues of urban redevelopment and those surrounding death and grieving. Our fear of death and the lack of concern for history and preservation in an age of rapid development and gentrification will be addressed through photography, video, sculpture, sound, painting, installation, drawing and performance. Just a quick mix I put together over the weekend. Unfortunately I lost all the music downloaded since 2014 when I transferred to a new laptop earlier this month. Didn’t realize it till after I’d already wiped the old one. Argh!! 2016 can best be summed up in the words of a gay Black man. 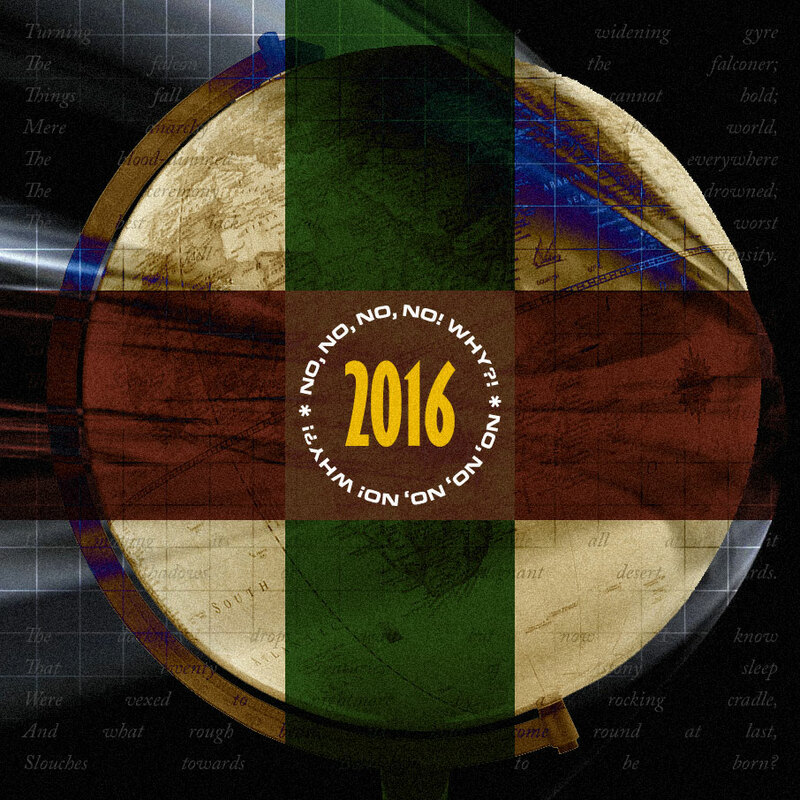 I’ve debated on whether or not to publish a favorite song list for the year. In regards to elections here and all over the world, I knew that keeping the status quo in power meant keeping things easy/hidden for another 20 years (which I was willing to play along with), but it at least would’ve bought us some time. Instead, the difficult realities I’ve foreseen intuitively for years will have to be faced much sooner than we’re prepared to deal with them. It feels like America is a runaway train about to fall off a cliff and we are powerless to stop it. Via Left of the Dial on KUTX. Trees and Pentangle (two of my fave English folk bands) have done covers of this song, I’m including this one because it’s the best thing I’ve found to fill a musical gap for me. 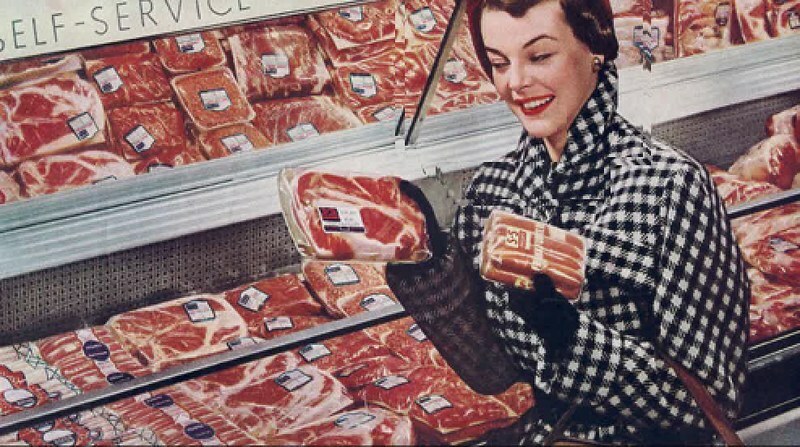 I spent a ton of time this summer researching a soundtrack to go with my Redneck Goth project because my visual art concepts are heavily musically influenced. I have a soundtrack in my head whenever I’m producing something, and I looked all over for good music to connect with my project – what I feel are the roots of country and goth – and that’s folk music. Depressing stories dealing with love and loss. The two diverged somewhere along the way about 40 years ago, and the artists that combined both either took themselves too seriously or were too campy. You either sound like a bad country radio hit or lame/gritty background music from a premium TV drama. The aesthetic of my zine just doesn’t exist and yet I can hear it in my head – take pop country songs and reinterpret them as shoegaze, and vice versa, or something like Air’s City Reading. This is about the closest I can get for now. This one goes out to the GOP. I’ve always had an appreciation for James Taylor’s songwriting, but not much so for his vocals and production. The Isley Brothers put forth a different effect on their covers of white songwriters on their album Givin’ It Back. I feel like I finally “get” this song for the first time in my life. My love affair with library and soundtrack music continues. No particular reason for choosing this one except to mention that I found it on Instagram via @twoheadeddogmusic. @texasvinyl is another one of my favorite feeds. I forget how I found Gary Wilson’s music, but the first things that came to mind were: 1) Is he still alive? and 2) He should come to Austin! #2 has happened already – Wilson played SXSW in 2011. I didn’t get a ton of new music this year from sources other than my usual radio shows, programs, and podcasts – when I wasn’t listening to house music at the gym, which comprised the vast majority of my music consumption. Simon Harrison of Basic Soul provided several jams as usual, including this one. I’m making this one my motto for 2017. Graphic design guru Michael Bierut tweeted this song earlier this week. Couldn’t be more appropriate. “Faces” and its B-side “Feel the Fear” have become some of my favorite Italo tracks ever. In case you didn’t know it, all the cool kidz have been listening to vintage New Age music for the last couple of years. I first got into this genre last year and recently came back for more. Prediction: more shamanistic vibes to come in 2017, for we’re really going to have to center ourselves to deal with what’s coming. I had a chance to catch a couple of Bill Converse sets around town this year and it was a lot of fun. I discovered Jimmy Edgar and the ULTRAMAJIC label a couple of years ago on Instagram and have been a big fan of the label’s reinterpretation of 90s electro/rave/house music. 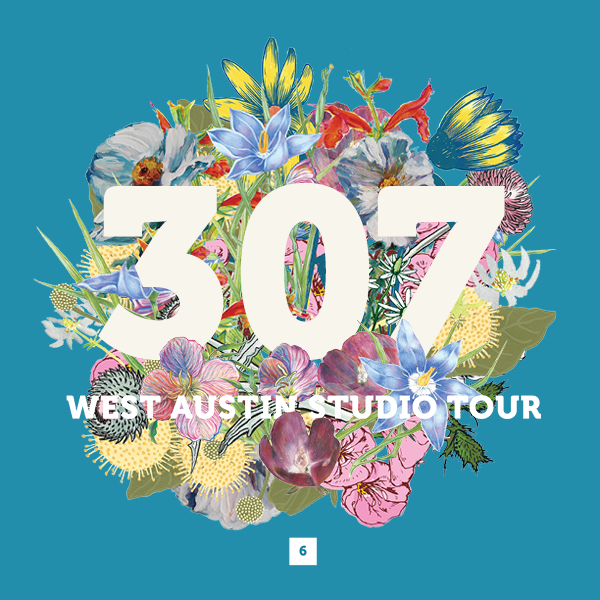 Finally, lest we forget, 2016 was the year that also gave us S I M P S O N W A V E.
I have work available at a couple of spaces during the 2016 East Austin Studio Tour. Stoked to have my Hippy Fit and Redneck Goth zines available at ATM Gallery; I’ve been a big fan of their exhibitions for a long time and I bought so much stuff at their shop last year. I’ll also be showing new work the second weekend of EAST at Handsome as part of a group show curated by Gerardo Arellano. Honored to be featured with lots of old friends and other Austin art stars I’ve admired for years. Don’t miss this one! Flyer design: me x Handsome. Myself and some of the other Big Medium volunteers will be having a little art show next weekend. Should be fun – join us!